Ziad Awad, convicted murderer of Commander Baruch Mizrahi on Passover eve, 2014, previously released as part of Shalit deal. 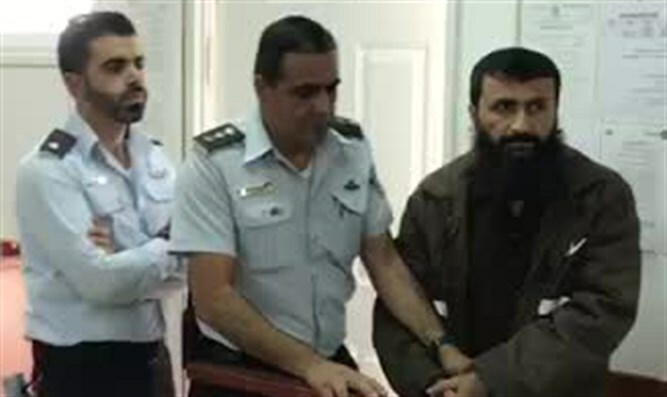 The military court in Ofer sentenced two life sentences and another 16 years in prison for Ziad Awad, the terrorist convicted of murdering Baruch Mizrahi on Passover eve, 2014. Awad, who was released as part of the Shalit deal, was also required by the court to pay NIS 250,000 to the widow Hadas Mizrahi and NIS 25,000 to each of the other members of the Mizrahi family. Baruch Mizrahi, Hadas Mizrahi's widow, arrived at the military court where the verdict was read. The son of Ziad Awad, 'Izz a-Din Awad, convicted of helping his father by escaping with him on a motorcycle from the murder scene, was sentenced to 20 years in prison. In addition, the son was also required to pay NIS 250,000 to Hadas Mizrahi and NIS 25,000 to each member of the Mizrahi family. Chief Superintendent Baruch Mizrahi, 47, from Modi'in, was murdered on Route 35 near the Tarqumiya-Idna junction in the Hevron area, leaving behind a wife Hadas, who was moderately injured in the attack, and five children. Mizrahi served for the last three years of his life as head of the signal intelligence section of the Investigations and Intelligence Division of the Israel Police National Headquarters. He joined the police after completing a 25-year career in the IDF, which he completed as an officer with the rank of lieutenant colonel in Intelligence Unit 8200.